During my last trip out to The Muqata I had the pleasure of discovering that both Jameel and Joe Settler are accomplished musicians. Since they had never blogged about their musical talent it was a pleasant surprise. I have some very pleasant memories of jamming with Joe and Jameel to a little tune we call Muqata Madness. One of these days we'll have to find some time to record it. Maybe we can use it as the intro for the next podcast. On the other hand we might want to save it. I don't want to go about telling tales but there was discussion about creating some sort of blogger band and then cutting an album. We're not looking to do anything crazy, but thanks to technology it has become exceedingly easy to do things like this. MP3's are nothing. Although I have to admit that what I'd really like to do is see at least a couple of copies of the album produced on vinyl. That would be really cool. Just picture an album cover of guys with big yellow happy faces. I can feel your excitement. To quote my grandfather, "that is emes." And there you have just a little more insight into some of the bloggers you might encounter in cyberspace, or elsewhere. Jameel pointed this out to me, but didn’t want to post about it himself. Occasionally one hears very strange stories as to what goes on in Meron and how an "Aliyah" to a certain Holy Kever will bring about the birth of a child for the couple that goes up there to try to fulfill this mitzvah. The Israeli version of an Urban Myth? But the IDF caught the terrorist that killed the Kahane family (and murdered many others in suicide bomb operations he organized) is a quite similar story. 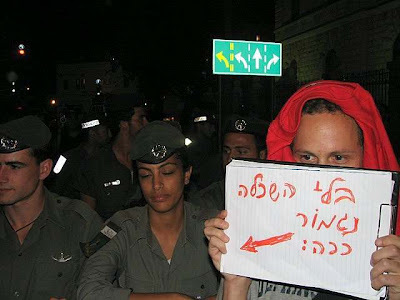 It seems Khaled Shawish was caught in the act during his own Aliya laregel. Khalid was caught during a nocturnal visit to the Muqata Kever. Not Jameel’s Muqata, but Arafat’s. He was there to perform a mitzvah in the back seat of his jeep right next to Arafat's grave...but not with his wife (uh-oh). Since this one is documented, I’d say it doesn’t fall into the Urban Myth category. The upcoming Jewish year (only 4 months away) is the 7th year of the 7 year Sabbatical cycle of Eretz Yisrael. During the 7th year, the "Shmitta" year, Jewish residents of Israel are forbidden to work the land, and rely on G-d's promise of an abundance of produce the previous year -- and take a step back, relax and study Torah. The idea is similar to that of "Shabbat", the 7th day of the week, when we are commanded to rest from work. In our modern era of mass produced agriculture, we find ourselves with luxuries that didn't exist thousands of years ago; supermarkets, retail produce available at affordable prices, and an availability of produce never dreamed of even a few hundred years ago. "Heter Mechira" (Permission to Sell)": Similar to a halachik Jewish-legal method, "Heter Iska" instituted by great Rabbis over 100 years ago (Rav Yitzcah Elchonon and others) due to the extremely difficult financial situation of the small yishuv in Israel at the time and was continued by R' Kook, one of the leading rabbis in Israel about 80 years ago. This "heter" (permission) allows for only the top soil to be sold to a non-Jew, thereby all the produce is harvested from non-Jewish owned land. After Shmitta the land is sold back to its Jewish owner. Problem: There are many who frown upon this permission, saying it's either not applicable at all (there were great Rabbis who disagreed completely with the heter to begin with i.e. Chazon Ish, Beit Halevi, Netziv and more… ); R' Kook only instituted this solution for a specific year, and it would need to reexamined by a Beit Din on a year-by year basis; and R' Kook instituted this for years when no alternative, "better" solutions could be found. For more information on Heter Mechira, its issues and controversy, please see this excellent article by R' Howard Jachter. Problem: Not enough farmers engage in such a solution, therefore, not enough produce exists. Buying produce from non-Jews. Some organizations buy produce from non Jews in Europe and other places outside of Israel. The Eida Chareidis, an ultra-Orthodox oragnization has just contracted a multi-million dollar deal with the Palestinian Authority to receive produce from Gaza. Problem: Money to the Palestinian Authority is quickly converted to guns, bullets and Qassam rockets which are routinely shot at Israelies. As a side point, it's hypocritical for some to buy from Gaza or West Bank Palestinians all year round for a cheaper price, and then beat their chests at those who only buy from Palestinians during Shmitta. Driven by Zionist motives and founded on agrotechnical innovations, the new system aims to strengthen Jewish cultivation of land in Israel, contrary to the strictly Orthodox kashrut committees, which approve only the purchasing of produce from non-Jews during the fallow year. 1. Produce grown in greenhouses, where the soil is physically detached from the ground, thereby the produce is not "grown on the land"
3. Produce grown during the sixth year whose shelf-life has been prolonged. To get produce from the Otzar Ha'aretz program, you need to sign up in advance (to help ensure the money goes to the farmers), and for every 50 NIS you give Otzar Haaretz, you receive a 50 NIS voucher to buy produce during the Shmitta year. The initial outlay is 50 NIS, so if things don't work out, your maximum liability is 50 NIS. Other than that, you pay for the vouchers on a monthly basis. When you sign up, you are guaranteeing that you'll buy at least 50 NIS of stuff per month. (You can of course buy more). The institute was established twenty-one years ago in Gush Katif, in order to provide guidance to Jewish farmers who want to fully observe the mitzvot related to the land, especially in view of modern technological developments in agriculture and agricultural mechanization. The institute is deeply involved in the halachic and conceptual approach of Rabbi A.Y. Kook and his disciple, the late Rabbi Shaul Yisraeli. It operates under the guidance of the former chief rabbis, Shapiro and Eliyahu, who advise the staff and the rabbis of the institute in practical matters. 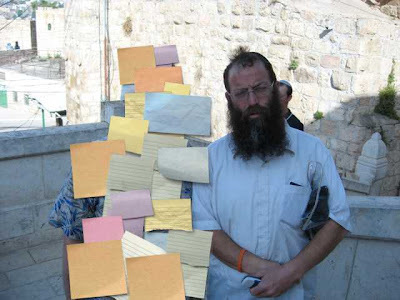 The heads of the institute are Rabbi Yaacov Ariel and Rabbi Yigal Kamintsky. During the six years of planting, the staff of the institute advises farmers in such matters as identifying specific species, kela`im (intermingling of species), orlah, terumah, and maaser. As part of this activity, the ``Beit Ha`Otzer`` fund, which provides a practical way to observe the mitzvot of Maaser Rishon (given to a Levi), Maaser Ani (for poor people), and redemption of Maaser Sheini. Beit Ha`Otzer serves thousands of people throughout our land, giving them a simple way to observe the mitzvot of maaser and terumah. The rabbis of the institute have responded to dozens of questions from all around the country, in addition to writing books and teaching about the mitzvot that are related to the land. One year is special in every seven year cycle, and that is next year, 5768, which is Shemitta. This has many complicated laws. The institute has taken on several central tasks as the next Shemitta year approaches: To publish the full text of the book by Rabbi A.Y. Kook, ``Shabbat Ha`Aretz,`` from handwritten manuscripts, and to educate about the laws of Shemitta, printing both scholarly rabbinic texts and summaries for the general public, using modern audio-visual techniques. The objective of all the work is to benefit Jewish farmers. Next year will be the first one that the institute does not operate from its natural site, in Gush Katif. The expulsion that we experienced did not curtail our spirit, and as preparation for the Shemitta we have established an organization known as "Otzar Haaretz." This will provide consumers with fruits and vegetables mainly from Jewish farmers who observe the laws of Shemitta, in order to encourage Jewish farming within our land. It will provide fruits and vegetables exclusively from Jewish and not Gentile sources. Otzar Haaretz, which was established under the guidance of four rabbis – Shapiro, Eliyahu, Lior, and Ariel – sees as its objective to raise the spiritual level of Yisrael to new heights, both in observance of the laws of Shemitta and in increasing contact within the nation, specifically between food producer and consumer. The greater the number of consumers who are willing to observe the laws of Shemitta, the more farmers will be privileged to observe Shemitta and its laws. The result will be ever greater amounts of fruits and vegetables that have the sanctity of Shemitta. It is a mitzva to eat produce that has Shemitta sanctity. There are those who wash their hands before eating fruit from Eretz Yisrael, and during Shemitta there is an additional element of added holiness. We should make an effort to reveal the sanctity of the fruits of Eretz Yisrael. Note: I am not affiliated in any way with Otzar Haaretz, but I have signed up to join their produce program for Shmitta, and personally think its an excellent way to observe Shmitta, a way to continue supporting Jewish agriculture in Israel, all without giving a single Shekel to terrorists. Yet another fatality in Sederot. 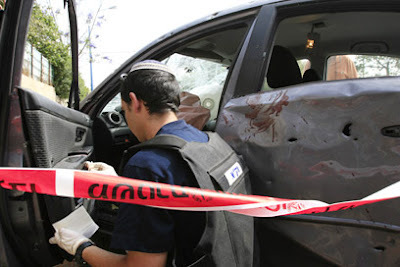 A man was killed Sunday morning in the southern town of Sederot after a rocket landed near the car he was sitting in. The man, 36-year-old Oshri Oz of Hod Hasharon, crashed into the wall with his car after it was hit. He managed to get out of the vehicle and take a number of steps before collapsing. He was evacuated to the Barzilay Medical Center in Ashkelon, where he died of his wounds. Oz was a computer technician who used to visit Sderot often as part of his work. He was survived by his pregnant wife and a 2-year-old daughter. Sederot hasn't been receiving much protection from Israel's government, so they decided to print their own money. Will anyone accept responsibility for the Disengagement's security fiasco? No one from Kadima or Labor, that's for sure. I recall it more or less...it was an ordinary day in shul a month before my Bar Mitzva. It wasn't simple putting them on -- the leather chaffed my arm, the straps coming down from my neck kept flipping around...you know what I mean. A much older friend (like 50 years older) came over to me and took my tefillin box, suddenly flipped it open like a StarTrek tricorder and said, "Kirk to Hashem...Kirk to Hashem...got a guy here putting on tefillin for the first time...he could use some help." That put me a bit more at ease. Yet other than that, I don't recall much about it. So...my son put on tefillin last week for the first time as well and we decided to make it more meaningful. Instead of just putting on tefillin at shul in the morning, we drove to Me'arat HaMachpela in Hevron. We met some relatives at "Tzomet haGush" (the intersection of Road 60 in Gush Etzion where you make a right to Alon Shvut), so those who felt less at ease travelling to Hevron, could drive behind us. It took about 15 minutes to drive to Kiryat Arba, we drove through it, and then straight through the gate leaving Kiryat Arba into Hevron. There's even a yellow stripe on the road so you can follow it straight to Mearat HaMapchpela. About 5 minutes later we were all parking in the middle of Hevron next to the Me'ara. We brought our own "minyan" of 10 and had our own tefilla...with my son putting on tefillin for the first time. While we go to Hevron a few times a year, some of our guests hadn't been there in many years, and were happy to have gone. We had another simcha to run to after minyan, so my son and I said some Tehillim at each of the "tziyonei kever" in the Me'ara (explanation later if I have time) took some family pictures outside, and then drove back. Luckily, JoeSettler was available to complete our minyan, (or just read the following posting after this one) but there were so many people there, we could have asked anyone to help out. 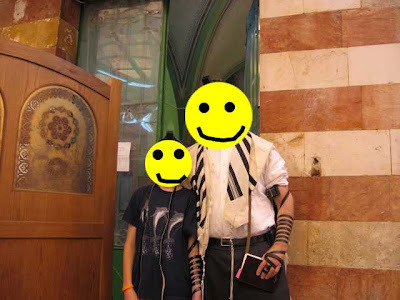 I don't know how to properly end this posting, but I would like to hope that my son will remember that day with deeper appreciation of his connection to his heritage and Am Yisrael. It seems that son number 2 (0f 18) from wife # 1 (of 4) was putting on his tefillin for the first time. After some mumbled explanation as to what I was doing at the Tomb of the Patriarchs (I obviously couldn't mention the secret meeting with Baruch Marzel) I was invited to daven with Muqata clan. FOR THE REST OF THE STORY GO TO JoeSettler. 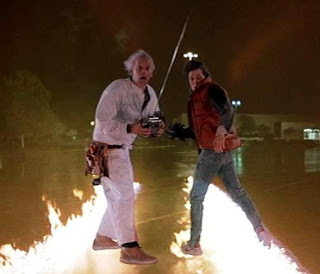 Breaking News: Mossad and CIA Hire Doc Brown to outwit Iranians! Intelligence operatives in the US and its allied nations have sold Iran flawed technological components in an attempt to sabotage the country's nuclear enrichment program, CBS News revealed Wednesday evening. In January 2007, the head of Iran's Atomic Energy Agency, Vice-President Gholamreza Aghazadeh, said after an explosion at the Natanz nuclear facility (the first Iranian plant to attempt enrichment) that some of the equipment had been "manipulated." US intelligence is obviously taking it's cue from the Back to the Future movie, where Doc Brown sold Libyan terrorists old pinball machine parts in exchange for enriched plutonium. Marty McFly: [looks through a camcorder] This is uh... This is heavy duty, Doc. This is great. Uh... does it run, like... on regular unleaded gasoline? Dr. Emmett Brown: Unfortunately no, it requires something with a little more kick - plutonium. Dr. Emmett Brown: No, no, no. This sucker's electrical, but I need a nuclear reaction to generate the 1.21 jigawatts of electricity I need. Marty McFly: Doc, you don't just walk into a store and buy plutonium. Did you rip that off? Dr. Emmett Brown: Shhhhhh. Of course. From a group of Libyan nationalists. They wanted me to build them a bomb, so I took their plutonium and in turn, gave them a shoddy bomb-casing full of used pinball machine parts! Come on! Let's get you a radiation suit. We must prepare to reload. NY Police target Yeshiva College student. After reading the following news tidbit over at DovBear's, I have to wonder if Israel's finest have been giving pointers to NY's finest -- on how to deal with Jewish students. NY's Finest: YU student recovering from a hernia operation with prescription drugs for the pain is pulled over and thrown in jail. Israel's finest: Students demonstrate by blocking traffic over increasing tuition and the Israeli government's refusal to discuss any grievances -- and get their heads bashed in, requiring hospitalization. Brooklyn student is looking to put the hurt on the city after spending an agony-filled night in a precinct cell just one day after hernia surgery - minus his pain medication. Simon Weiss, 22, said cops ignored evidence of his surgery when they arrested him on May 9 for possession of two Vicodin pills. Not even a call from his Beth Israel Hospital doctor - a police surgeon - could free him. Weiss, who attends Yeshiva University, and a friend were pulled over at Coney Island Avenue and Avenue O just after 3 p.m. When the cops found the pills, Weiss showed them his bandages. His roommate even rushed to the precinct with a copy of the prescription - to no avail. By midnight, Weiss, in too much agony to sit or lie down, was leaning against a cell wall and moaning for an ambulance. At 4 a.m., cops finally took him to Coney Island Hospital - where doctors treated him with Vicodin. Too bad you can't sue the police here in Israel...we're wishing good luck and a speedy recovery to our friend at YU. Bottom Line: Educate yourselves quickly lest you end up like a NY or Israeli cop. Real Bottom Line: Avoid the police at all costs, they're above the law. Through the wonders of modern computer technology, a grand total of 8 people are claiming to be the lucky 200,000th visitor to the Muqata blog! Some sent screensnapshots of the lucky "200,000" and others sent complex data dumps and router tables proving that they are the real winners. 4. Clean up our combination "study/office/library/computer room/archive and bombshelter"
And...work on a jblogosphere surprise...so...I will have to get back to you on who the real winner (or winners) are. Wishing you all a Happy Shavuot; Chag Sameach! It is Jack and as an unofficial member of the Golden Ticket Awards committee I'd like to share a few awards that you will not be winning. Item #1. In this contest we are not awarding the tender and delectable baby sandwich. 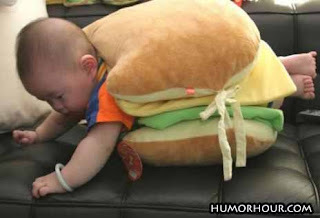 In spite of Rubashkin's guarantee we fail to see how said baby sandwich cannot be considered treif. Item #2. 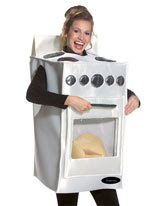 The old bun in the oven costume is considered by some to be among the golden standards of holiday costumes. But something tells me that this isn't going to quite cut it anymore. Besides, any bun in the oven costume that doesn't include a griddle for making waffles is a bad dugma for society and we can't have that. A day without a waffle is like a Muqata without Jameel. I'd like to share more here but I would hate to impinge upon the committees toes. So I'll open up the floor and ask for them to provide their own input. Today, the 200,000th visitor to the Muqata will be arriving at this blog! Remember the Golden Ticket from Willie Wonka and the Chocolate Factory? Would you like entry to the top secret Muqata Waffla Factory? A limited edition muqata t-shirt? A signed picture of Jameel @ The Muqata? 200,000th Muqata Points? The possibilities are simply endless. Will YOU be the 200,000th visitor? Keep track of the sitecounter down below...and your IP address, and let me know by email. And if you haven't read it yet, I highly recommend this posting from yesterday. It got knocked down because of the other posts...but it's definitely worth a read and a chuckle. It is the best of the Jblogosphere: Click here. Sunday, May 20th. On the brink? Friend of the Muqata, Robert Avrech has coined a name of the upcoming (or already happening) war in and around Gaza..."The Inbetween War"
While there are those such as JoeSettler who think we are not at the brink of war -- and bring as proof that the Israeli government is mulling over the stationing of international troops in Gaza to protect Israel...if you ask any kid in Sederot if there's a war going on or not, they will say absolutely. Just because Israel refuses to take serious action against Gaza, and tycoon-billionarie Arkaday Gaydamak is doing more for the people of Sederot than the Israeli government, does not mean we are not at war. This past summer, the government refused to declare 'war', yet everyone knew we were at war -- They kept referring to it as "fighting in the North." So, why is this war? If it looks like war, smells like war...then we're on the brink. Qassam rockets continued to fall in southern Israel and in light of the estimation that the situation would continue for many days. At least 125 Qassam rockets have landed in the western Negev in the past five days, the IDF reported. 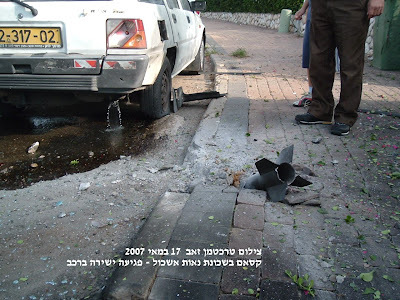 Five rockets land in wetsern Negev on Sunday morning; one hits empty house, seven people suffer from shock. On Saturday night, IAF attacks Qassam launching cell, car carrying Hamas members and rocket-manufacturing facility. Today's question: Who's really running Israel? The correct answer is, "The Winograd Report"
Israel's politicians are scared into paralysis of any serious military action -- and are afraid of getting blamed by a future Winograd Report. So while children in Sederot continue to sleep in bomb shelters, Israel's government sticks its head in the sand and hopes this problem will go away. 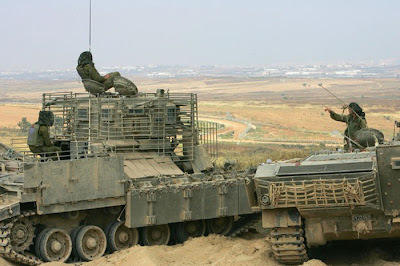 Muqata Prediction: Israel will be dragged into this war kicking and screaming...and it's only a matter of days. True Story - Exclusive for Readers of the Muqata blog. He was at a shul in (omitted to protect the guilty), which he described as at the liberal end of dati/religious shuls. The father's eyebrows furrowed-up in concern, and he launched into a whole explanation of how some couples are male/male or female/female instead of being like male/female couples and families, and explained he how we need to be open and understanding even though they are different than us, etc., etc., etc. After about 5 minutes the father stops and asks his kid if he understands. Out they come from the "boydem" (Vernacular Hebrew word for semi-attic space), the wardrums are being dusted off. 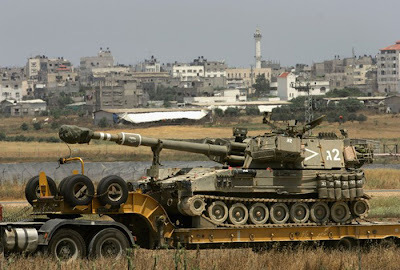 11:48 AM Heavy IDF artillery returns to Gaza. 11:44 AM Kol Yisrael Israel Radio reports of Palestinian wounded in Gaza near thr Islamic University due to ongoing Hamas-Fatah fighting. 11:12 AM The stats that run our lives. As of now, 12 Qassam rockets have landed around Sederot this morning, which makes 106 this week. The IDF has taken up positions in Northern Gaza on the ruins of Dugit, a settlement destroyed and evacuated during the Disengagement. 10:41 AM Nine Qassam Rockets hit Sederot this morning, including direct hits on a gas station, private home and apartment building. Minor injuries reported. Olmert showed up last night at a shul in Sederot. 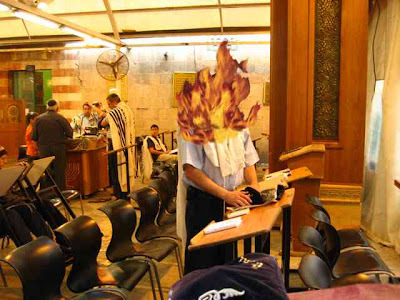 After he left the shul received a direct Qassam hit. I guess I'll be grilling chicken this afternoon. 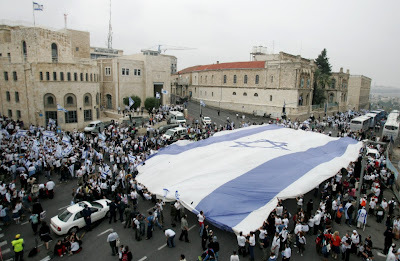 Yom Yerushalayim Picture -- biggest flag ever! Wishing everyone a quiet and peaceful Shabbat, especially to Sederot, the MDA volunteers there, and the IDF troops in and around Gaza. PS: As Im typing this (9:52 AM) , 5 Qassam rockets just hit Sederot. One direct hit on a house (1 woman wounded lightly), One next to a gas station, and another direct hit on a building (no reports yet). Am I going to have to start posting in "war" mode again? More Only in Israel...a picture. From the mailbag...photo courtesy of Tzvi Harris (c) 2007.
by the Egged public bus company. for those who visted the Kotel over Shabbat. should be paid for on Sunday without delay. Can you imagine that anywhere else? The honor system for public transportation? All Rights reserved to Zev Trachtman. Taken today, May 17, 2007 in Sederot. Mazab Bashir, 25, from Deir el-Balah began working with Doctors Without Borders five years ago. On April 19, he confessed during a Shin Bet interrogation that for months, he had been collecting intelligence on senior Israeli officials - including Olmert and a number of Knesset members. Bashir met with the Popular Front for the Liberation of Palestine in September 2006, and said that the assassination was meant to avenge the deaths of Palestinian civilians. Bashir was indicted Thursday in the Jerusalem District Court. Duncan Mclean, head of 'Doctors Without Borders' in the region, told Israel Radio, "I don't think embarrassed would be the right word. We are very sad for Bashir who has been working for us for almost six years. But we would like to make it very clear that we make a distinction between his professional work and what he does on his personal time in the sense that all our staff is hired for professional reasons and I don't think our organization can be held liable for every aspect of their life." If a humanitarian-medical organization would say that about Dr. Baruch Goldstein, don't you think they would immediatly lose their legitimacy in the eyes of the world (and media), yet they can say that about Mazab Bashir? Sorry I didn't post about Yom yerushalayim yesterday...will still try to get to it soon. 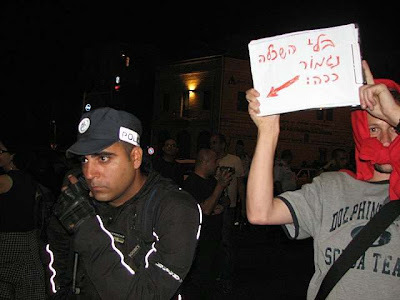 Sederot under fire: The Shame of Israel. I will post about Yom Yerushalayim (Jerusalem Reunification Day) later, but as on all the radio stations and news updates today, our first priority has to be what's going on in Sederot. Actually, it's almost everyone's top priority. It doesn't seem to bother the Israeli government that much, let alone Prime Minister Olmert or Defense Minister Amir Peretz. 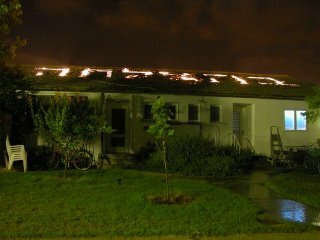 Last night was one of the scariest for the Western Negev town of Sederot. 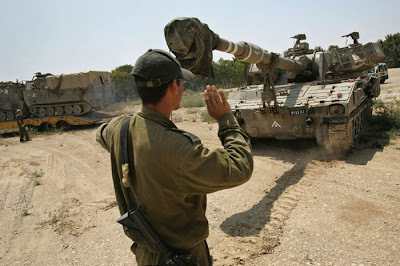 More than 20 rockets were fired at the town, resulting in Israeli wounded, some seriously. Dozens of shock victims flooded Barzilai hospital for psychological help. Yet, I'm amazed by the experts in the media. Every single one says there is no military solution to the rockets being fired at Israel. Not one member of the Israeli government has a moral backbone to defend the poor residents of Sederot. Why don't they comprehend that it is our moral and ethical right to defend ourselves? Even at the expense of a full-scale ground operation into Gaza, even at the expense of collateral damage among Palestinian civilians, even at the expense of world opinion turning against us, even at the expense of imposing full IDF mandatory military and civil administration over the entire Gaza strip -- it is our right and it is imperative for it to be done now. When the residents of Sederot are literally begging for a solution, and the best Israel can come up with is, "limited and precise targeted air strikes," it is truly a disgrace. Sederot residents are pleading with Soviet billionaire Arkady Gaydamak to provide buses and temporary refuge, since they know that Olmert's government is incapable of providing them basic security or basic living alternatives. And yet, let's take a look at what's going in Gaza itself, the liberated and free Palestinian area of autonomy. The warring Palestinian factions (also known as terrorists and political parties), Hamas and Fatah declared a ceasefire at midnight after they managed to kill 16 of each other yesterday. And how long did their ceasefire last among themselves? Hamas gunmen fired mortars at the house of Fatah security chief Rashid Abu Shbak before storming it and planting pipe bombs inside, the officials said. The gunmen killed five of Abu Shabk's bodyguards, and a member of President Mahmoud Abbas' presidential guard. The "experts" on the radio preached today: "There is no military solution to what's going on in Gaza"
I say, there's no one to even TALK to in Gaza. The Palestinians can't even control their bloodlust from killing each other for a few hours, let alone going after Israel. And we are supposed to negotiate with them? The original sin of our problems goes back to the Oslo agreement. Signing a peace treaty with a terrorist and importing 40,000 terrorists was guaranteed to lead to this sort of anarchy. And a unilateral disengagement was destined to be a security failure. Akiva has a very worthwhile post about an IM conversation he was having with a resident of Sederot...during a Qassam attack. Check it out. On the heels of the news of the impending opening of Jameel's Waffle House we have received a host of questions regarding the level of Kashrus and who is going to oversee it. Various people interviewed for the position including half the wait staff at Lax and Mandel who rightly desire to flee the land of the burning river. Our very own Ezzie (who admits that clevelanders are cursed) is among the finalists for the position. Unfortunately Old Ezzie does have a black mark next to his name due to his involvement in the mysterious disappearance of Jameel this past March. We'll have to see if he can redeem himself. Stay tuned to MPR, Muqata Public Radio for more information. Today marks the "Naqba" day! Those who were upset by the creation of the State of Israel on May 15, 1948, annually commemorate "The Naqba" (The Catastrophe) on May 15th. Let's examine how an Israeli newspaper, "Yediot Achronot" attempts to cover the same event on their Hebrew and English websites. עשרות סטודנטים ערבים הגיעו למתחם האוניברסיטה העברית בהר הצופים בירושלים במטרה לקיים טקס לציון יום ה"נכבה". הסטודנטים הגיעו למקום כשהם לבושים בחולצות שחורות וכאפיות כשהם צועקים "ברוח ובדם נפדה אותך פלסטין". I will translate this word for word, so you can accurately compare it to YNET's "translation"
Tens of Arab students arrived at the Hebrew University Mount Scopus campus with the intent of hold a commemoration ceremony of the "Naqba". The students arrived wearing black shirts and kafiyas and screaming, "With Spirit and Blood we will redeem you Palestine"
Opposite them, Jewish students arrived, some from the organization "If you will it", and disrupted the when they tried to hold a moment of silence, by singing songs about the Land of Israel and Jerusalem. Police are at hand to secure both sides. Jewish students sang the Israeli national anthem and other nationalistic hymn at the Hebrew University of Jerusalem in a deliberate attempt to disrupt a ceremony organized by Arab students to commemorate Nakba day, the day on which the State of Israel was established. Why is the headline in Hebrew start with the news event about (Israeli) Arab students at the Hebrew University commemorating the birth of the State, while the English edition gets straight to the point: "Jewish students disturb the Naqba Commemoration" Now that certainly puts things into perspective right way! The Jews dared to sing "nationlistic" songs, disturbing a peaceful Arab event. Why the English edition is so Anti-Israeli, while the Hebrew edition gives a much more Pro-Israel version of the event? We wish a Happy Naqba to all the readers and visitors of the Muqata blog, and remind you that tomorrow is Jerusalem Reunification Day, Yom Yerushalayim, as Israel celebrates the 40th year of liberation and reunification of Jerusalem, Judea, Samaria and the Golan Heights. Almost made it to Kever Yosef last night. 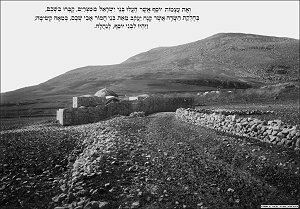 This picture of Kever Yosef in Shechem, taken around the time of WWI by a British soldier is more interesting in what's missing, than what you see. Note the almost total absence of Arab homes. 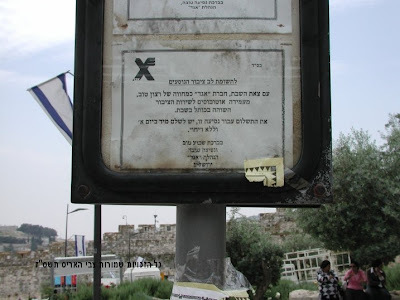 This is the way I remember Kever Yosef...the last I time I saw it, 3 days before the IDF abandoned it under fire. Unfortunately, after spending hours trying to get there, bypassing various IDF and police checkpoints, avoiding the Breslover nutcases trying to get on a bus, and driving through the peaceful Hamas village of Chawara just north of Shechem...I gave up and drove home. We even made it to the famous IDF base, "Base 3"...but because of totally evil and pathetic Israeli policement, we missed the bus by a couple of minutes. We would have gotten to the bus with an hour to spare. Rafi G gives his description of last night over here though he didn't make it in either. 1. Didn't go to the mikva first. 2. Didn't go with him at 2:00 AM. 3. I'm too square, and I should have ignored the policeman who had no reason to lie or prevent me from going on the road the way I planned to. And now, on to the regularly scheduled post. Spiderman seeing his blog persona? The Mrs. and I rarely go out to movies, and I can even count the number of movies we've seen in the past 5 years in the theater on one hand. So...last week, we went to see Spiderman 3. With Lag Ba'Omer having come and gone, we went out with some friends to Cinema City, Israel's coolest cinema. Since we rarely go out, we treated ourselves and paid extra money with our friends to get upgraded seats. It's like flying First Class instead of Coach. Picture the following: Before the movie, you arrive early with your prepaid tickets and reservation to a private VIP lounge. Sitting down with your friends, all the food in the lounge is free (well, you did pay extra!!) -- eat and drink as much as you like. Champagne and Wine...ice cream (Ben & Jerry)...soft drinks...fresh cut fruit and vegetables...coffee, espresso, latte, tea...take your pick...it's all there for you to eat as much as you wish. When it's time for your movie to start, the movie hostess announces that the movie is about to begin, and you exit the VIP room directly into the private balcony of the movie theater. You can't even see the "coach class" seats below! With only about 40 seats, the VIP exclusive treatment means you get a large leather seat with electronic controls (and footrest!) that competes with LAY-Z-Boy chairs (or first class seats on British Airways). With mini tables between the seats, there is ample room for the food you bring with you from the "lounge"...ice cream, popcorn and drinks. You get the same wide screen movie experience with stomach churning Dolby Surround-Sound TM, and yet, you get pampered with additional luxuries and extras. Now, so why is it so much better to see movies here? Not because there are tons of commercials before the actual movie starts, but because there are now COOL "only in Israel" commercials! What's a COOL "only in Israel" commercial? Where it asks you Jewish related trivia questions on expressions, and you have to figure out what the Jewish source is. I'll try to have some examples in a later post. Well, movies at the theatre are apparently not meant for my wife and I. As on our first movie date, she fell asleep during the movie -- I assumed because I was just too boring a person. (Luckily for me, she married me anyway) I guess the extra comfortable seats in the VIP section caused her to fall asleep...again. (I didn't take it personally). I liked the movie, since its exactly how I would expect a comic book to be thrown onto a movie screen -- Dizzying digital ink with computer enhanced graphics. 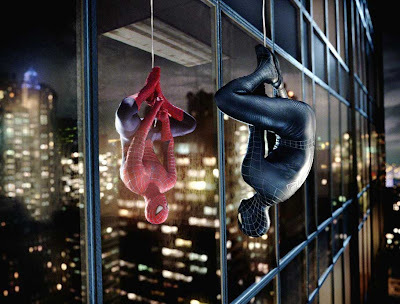 Now, if there were going to be a Spiderman movie based on the JBlogosphere, or the Jewish world, who would the villains be? 1. CANDYMAN! This guy from the shul, larger than life with a tallit-bag full of weaponized candies to be thrown. 2. Hot Chanie. 'nuff said. 3. Holy Hyrax, Batman! Ooops, sorry, wrong comic. 5. Would the Renegade Rebbetzin be a superhero or villain? After voting for the Muqata blog in the JIBs, let me know what you think...This could easily turn into an interesting JBlogosphere project, which I'm sure the Holy Hyrax would love to illustrate. The Final Lap...and we need your support! Fine, I can hear you all groaning...Jameel, another post about the JIBs? Get over it already! However, the Muqata blog is running in many categories, and your help is needed in each and everyone of them! Let me explain WHY the Muqata should be the blog to receive YOUR vote. Just click each category message to vote... Remember! Based on our results, we're contemplating the Muqata Waffle Victory Breakfast. If you only knew how much effort went into the banner atop the Muqata blog. Designed by superstar Australian artist blogger Sarah, it took literally months of iterative work. The rest of the blog has gone through a few changes, and we try to make it visually appealing. We even had special banner's during our wartime liveblogging coverage this past summer. Does the Muqata make a difference to your life? Are we just a blog for your entertainment, or do you come away thinking about something with a new insight? Have we touched your life to make you more aware of issues facing the Jewish people in Israel? Are you more connected to the land of Israel having read this blog? We sure hope so, because that's the mission statement of the blog. This past summer, I put my life on hold to give you accurate, up-to-the-minute breaking news of coverage of the second Lebanon war. Going up north and taking pictures (while nearly getting hit by a Katyusha), pictures and video clips that you didn't find anywhere else. The Muqata was the place to get the real picture of what was going on last summer. The numbers proved it, and our site counter raged with thousands of daily visitors. We're pro Israel, pro-Eretz Yisrael, but that doesn't mean we're necessarily pro-Olmert. When the war hit us last summer, we stood solidly next to the IDF in our battle against Israel's enemies, but when politicians abuse their status to further their own goals, we are not silent. The same goes for the Disengagement -- we are pro-Israel, yet completely disagree with the Disengagement and think it was a terrible calamity for Israel, let alone the way it was implemented, and the way the heroic pioneers of Gush Katif and the Northern Shomron communities were thrown to the dogs, abandoned, and scorned by Israel's government. Our life in Israel posts demonstrate try to bring out the good of the land, and show you why we think Eretz Yisrael is the land for all Jews to live in. Waffles and technia for breakfast? Vacations and tiyulim around the country? Join the Muqata family as I blogged about all sorts of trips, events, and holidays in Israel. Kever Yehoshua at midnight? Our olive tree? You know the BBQ chicken at the Muqata can't beat, and even Jack would come all the way from the US to taste our famous waffles. This podcast was one of the best unifying efforts of the whole JBlogosphere, and your vote is really for all of you who contributed to this effort...From Ezzie all the way down to Pamela Greenbaum. Recommendations coming here soon (watch this space in a few hours). RASHBI Pizza is under which hashgacha? To Demonstrate Or Not to Demonstrate? Would a Rav do this?